New York, October 2, 2013: New York Road Runners (NYRR) and Tata Consultancy Services (TCS) (BSE: 532540, NSE: TCS), a leading IT services, consulting, and business solutions organization, today, announced an eight-year partnership, with TCS taking on the role of Title Sponsor in 2014 of the premier long-distance athletic event in the world – the New York City Marathon. Beginning in 2014, the prestigious race will be called the TCS New York City Marathon and is a part of a year-round premier partnership between TCS and NYRR to provide support for the NYRR 5-Borough Series and key heritage events, as well as year-round youth and community-focused events and programs, starting November 5, 2013. The new global partnership—fueled by movement and empowered by technology—is built on a shared commitment to elevating the health and well-being of individuals and embodies TCS’ historical dedication to strongly supporting the communities in which it operates. The spark of this joint “movement” starts today in New York City, driven by TCS’ digital, financial, strategic and marketing support of NYRR events and programs, most notably a goal to make the New York City Marathon, the most technologically advanced and socially engaged marathon in the world. “We are delighted to be the title sponsor of the New York City Marathon from 2014. This partnership presents a great way for us to accelerate our engagement with communities in the New York area and across North America to raise awareness about health and fitness. Starting in 2014, we also aspire to make the TCS New York City Marathon a more technology-enriched and socially engaged experience for all its participants and fans across the world, using our core technology skills,” said Natarajan Chandrasekaran, CEO and Managing Director, TCS. With TCS, NYRR unveiled today the new logo for the 2014 Marathon, designed to commemorate the unprecedented new partnership and to provide an iconic uplifting symbol for the race. The new logo represents both organizations’ forward-thinking, community-focused vision. NYRR’s “Run for Life” manifesto champions the benefits of a lifetime of running, and is closely aligned with TCS’ Fit4Life program, which is built on the philosophy that “healthy individuals make healthy organizations.” Fit4Life, in natural alignment with NYRR’s “Run for Life” philosophy, is realized through the active engagement of employees and their families with local charities. 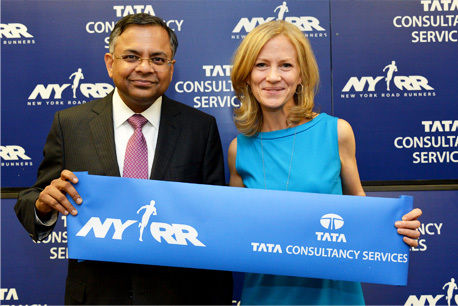 TCS has been a technology consulting partner for NYRR since 2010. It previously developed mobile apps for the 2013 NYC Half and will create a new app for the 2013 Marathon, helping participants track runners and receive race results, information on the event and tips for training. As part of the new partnership, beginning on November 5, 2013, TCS will be a principal sponsor of each of NYRR’s major five borough events and its key heritage events, including the Oakley New York Mini 10K, the Fifth Avenue Mile, and the Midnight Run, and will support NYRR’s youth and community programs. New York Road Runners was founded in 1958 when a small group of passionate runners vowed to bring running to the people. Over the past 55 years, NYRR has grown from a local running club to the world’s premier community running organization. NYRR’s mission is to empower everyone, of all ages and abilities—beginners and competitive athletes, the young and the elderly, adult professionals and underserved schoolchildren—to improve their health and well-being through the power of running and fitness. NYRR’s races, community events, instruction and training resources, and youth programs give hundreds of thousands of people each year the motivation, know-how, and opportunity to start running and keep running for life. NYRR’s premier event, the famed ING New York City Marathon, attracts the world’s top pro runners and committed amateurs alike while also raising millions of dollars annually for charity and driving economic impact for the City. But NYRR is equally committed to the runners of tomorrow, passionately providing youth fitness programs that educate and inspire more than 125,000 kids in underserved communities in New York City, all 50 states, and around the world. NYRR is proud to be a part of the World Marathon Majors—an alliance with the Tokyo, Boston, Virgin Money London, BMW Berlin, and Bank of America Chicago marathons—to advance the sport, raise awareness and increase interest and involvement in participatory and professional marathon running globally. A signature element is the WMM series which offers a $1 million prize purse to be split equally between the top male and the top female marathoner in the world. Tata Consultancy Services is an IT services, consulting and business solutions organization that delivers real results to global business, ensuring a level of certainty no other firm can match. TCS offers a consulting-led, integrated portfolio of IT, BPS, infrastructure, engineering and assurance services. This is delivered through its unique Global Network Delivery Model™,recognized as the benchmark of excellence in software development. A part of the Tata group, India’s largest industrial conglomerate, TCS has over 290,000 of the world’s best-trained consultants in 46 countries. The company generated consolidated revenues of US $11.6 billion for year ended March 31, 2013 and is listed on the National Stock Exchange and Bombay Stock Exchange in India. For more information, visit us at www.tcs.com. Anna Dinces, Rubenstein Communications, Inc.
Sophia Hitti, Rubenstein Communications, Inc.
Ben Trounson, Tata Consultancy Services Ltd.